I love to see companies lend their support for Breast Cancer Awareness Month, so I was very pleased to hear about Food Should Taste Good’s program: Food Should Do Good! As the maker of all-natural tortilla chips, Food Should Taste Good is “chipping in” to help support Ellen DeGeneres’ organization, Ellen for the Cure, in the fight against breast cancer by donating $150,000! And when you head over to Ellen’s Facebook page and “like” it, you have the opportunity to win a Food Should Taste Good Snack Pack and a $100 Whole Foods Gift Card. CLICK HERE to enter! Food Should Taste Good is also showing their support for Breast Cancer Awareness Month by turning their Multigrain and Sweet Potato packages PINK for the months of September and October! Don’t you love the pink bag?! Food Should Taste Good was kind enough to send me their new pink bags, plus their Cheddar and Olive varieties. Here’s what I wrote when my family reviewed their chips last year: “Tortilla chips from Food Should Taste Good are free of preservatives, cholesterol and trans fat, and don’t use genetically modified ingredients. They’re gluten-free and kosher, lower in sodium, and even a good source of fiber! But, of course, the big test is always the taste. 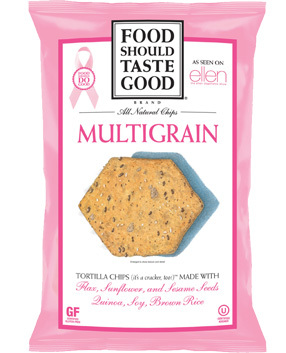 These chips passed that test with flying colors!” I hope you’ll pick up some pink bags of Food Should Taste Good tortilla chips at your local grocery store to support breast cancer awareness. Food Should Taste Good is also generously donating a box of their all-natural tortilla chips to one lucky winner! My box contained the Multigrain, Sweet Potato, Cheddar, and Olive flavors. Yum! To enter, simply fill out the Rafflecopter form below. This giveaway is open to U.S. residents only and will end at 11:59 PM ET on Wednesday, October 24, 2012.
the Cure. I'd like to try the White Cheddar. I'd like to try the white cheddar. I would like to try the sweet potato flavor. Jalapeno and Chocolate both sound delicious. I would love to try the toasted sesame. I want to try the olive flavor. I'd love to try the sea salt brown rice crackers. I'd like to try the Multigrain. I learned most of the chips are vegan!! I want to try the Kettle Cooked Salt and Vinegar Sweet Potato chips! O am just dying to try the salt and pepper Sweet Potato Chips! I'd like to try the Salt & Vinegar Sweet Potato Chips. White cheddar sounds really good. i'd love to try blue corn, chocolate, sweet potato, white cheddar and kettle corn. they all sound so delicious! I'd love to try the sweet potato chips. Thanks for hosting! I'd like to try the jalapeno chips. I would love to try the Sweet Potato Chips! I really want to try the White Cheddar chips! I'd love to try the Salt and Pepper Sweet Potato Kettle Chips! I would love to try the Salt & Vinegar Sweet Potato. I'd like to try the multigrain flavor! I'm kind of cheating here because I've already had them but the Hatch Chili tortilla chips are out of this world! I'd like to try the Works. I'd love to try their Chocolate flavor! I'd love to try the Sweet Potato chips. I would love to try the Jalepeno! I'd like to try the Lime flavored Tortilla Chips. I'd try the multigrain chips. I'd like to try white chadder. I want to try the cheddar - thanks! I would love to try Lime flavored Tortilla Chips! I'd like to try the Cantina! I'd love to try lime. I'd like to try the Lime flavor. Already love the sweet potato flavored ones. I'd like to try sweet potato. I like the Sweet Potato Chips. I really want to try the Jalapeno Cheddar flavor. :-) Thank you. I'd like to try the Kettle Cooked salt & pepper sweet potato flavor...yum! I would like to try the chcolate tortilla chips. I'd like to try the Jalapeno tortilla chips. I like spice. Hatch Chile or kettle Corn sounds so good!! i learned- Are your chips non-GMO? We are committed to using non-bioengineered ingredients in all of our products and are enrolling in the Non-GMO Project. Be sure to look for our new packaging, reflecting our continued commitment to non-GMO to start hitting shelves soon. For more information on the Non-GMO project, please visit nongmoproject.org. Would love to try the white cheddar one! The white cheddar sounds good. I would love to try the jalapeno flavor.